Vera ed il Vervece is an apartment with a stunning terrace and sea view. You can feel the sea breeze here and relax with a glass of wine at sunset. The apartment is stylishly decorated with floor tiles in gorgeous azure blue, the colour of the sea. The village Marina della Lobra is an old fishing port and dates back to the time of the Roman Empire. The little port is quiet with fishing boats bobbing on the waves. There is a relaxed atmosphere. You can hire a boat here to get to bays and inlets which are difficult to access by land. This area offers many walks, fine restaurants and a stunning coastline. Visit the island of Capri, Positano and Pompeii because these places are certainly worth your while. You will love Campania! Massa Lubrense is a great starting point for those who want to explore this region. We are just a few miles from the sea, and what a sea! Clear, clear waters will make you want to stay on the beach forever and never leave! 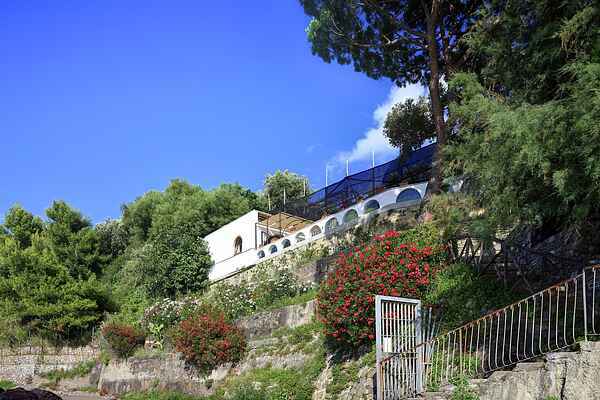 But just a few kilometers from here we have Sorrento and the famous Amalfi Coast known all over the world. Numerous and infinite villages to visit like Sant'Agata on the two golf courses, Marciano, Punta Lagno, Termini and much more!